Searchmetrics is all about SEO and content marketing. It analyzes elements such as rankings, backlinks, and traffic so you can see where your business stands in the world wide web. This information makes the optimization of your digital marketing strategies easier, which leads to a better online visibility, a larger traffic, and more revenues. The integration of Searchmetrics within DashThis provides a better overview of your business’ situation by connecting its ranking according to specific keywords and the effects it might have on your goals. Of course, you can easily put side by side data from Searchmetrics and from other platforms you might be using (such as GA or DCM), but you can also see your performance alongside the competition’s ranking. Your analysis will be more complete, and it will help you develop better tactics and strategies for your digital marketing campaigns. How convenient! Before creating your dashboards with Searchmetrics data, make sure you have the key to the API, so we can have access to the data. 1- When you’re logged in in Searchmetrics, click on Settings, located in the top bar, and then on My API. You can also directly visit this page. 2- You land on the page displaying all accessible API Keys. The API Key and the Shared Secret are not fully displayed. If you copy paste them from this page, characters will be missing and it will not work. Please click on the pencil icon, located at the right-hand side of the screen, under Options. 3- This brings you to the Edit API Key page. You now see the entire API Key and Shared Secret. These are the pieces of information you need so DashThis can access your Searchmetrics data. SearchMetrics employs a credit system to control the usage of its API and the export of its data. 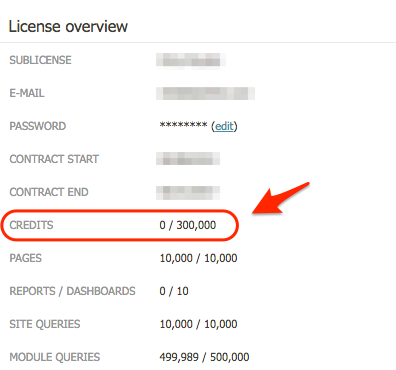 The number of credits available depends on the Searchmetrics license you own. For example, the suite Enterprise comes with 200k credits while the suite Ultimate includes 500k credits. Each indicator you want to incorporate in your dashboards costs a different number of credits so DashThis can import it. Unfortunately, DashThis does not have any control on the number of credits you have and how you spend them. Keep an eye on your credits, because once you have spent them all, DashThis will not be able to import data from Searchmetrics. You will have to wait for the following month to have your credits available again. We brought together a table displaying the approximate monthly credits costs for each indicator available, so you can choose wisely how you spend them. To know how many credits are still available in your account, click on Settings, located in the top navigation bar, and select My Profile. On the right-hand side of the screen, under the section License overview, you can see how many credits you can still use for the current month. Among the metrics available, DashThis can show a historic for two of them: Market Share and SEO Visibility. It means that, for the five other metrics, the system will not be able to track data prior to the date of creation of the widget. If you want to know how a specific campaign has performed for example, please create the widgets at the beginning of the campaign, so your dashboards will show all the data. If you have a Searchmetrics account, it’s now time to add this source to your marketing dashboard! You have explored this new integration and you have some questions? Contact our support team! This entry was posted in Integrations and tagged Managing Integration, Searchmetrics. How to create an Instagram Ads dashboard report?